The Marin Chapter is no longer accepting applications for the 2019 Summer Immersion Program. Click here to apply for our National Chapter. Please email kboscoe@amigosinternational.org if you have questions or would like more information. The AMIGOS Marin Chapter is part of a 25 Chapter Network that recruits, trains, and supports AMIGOS volunteers and families in their local community. Our chapter accepts participants during the fall prior to each summer experience. During the months of November through May, Marin Chapter participants will take part in local training and fundraising events as they prepare for their AMIGOS experience. The Marin Chapter has been in existence since 1971. Anne Kimball of Marin was the first and the only Marin teenager to travel to Central America with AMIGOS in the summer of 1970 to conduct inoculation clinics in Honduras. She commuted to San Mateo that year to train, but the following year her enthusiasm led her to the enlistment of 15 Marin teens and the formation of the Marin Chapter. Since then, we have sent nearly 1,000 participants into the field! AMIGOS is a leader in international youth development, creating a world in which young people realize their full potential as leaders and global citizens. We provide extraordinary opportunities for youth to design and lead projects in collaboration with US and Latin American peers and partner organizations across the Americas. Our strong partner network, built over 50 years, enables authentic engagements in communities across the region. I picked Amigos de las Américas as my program for cross-cultural exchange because of its unique visions and goals for both the participants and the in-country communities. Amigos is different than any other program for a number of reasons. The first reason is the intensive training program that prepares students for their cross-cultural experiences. Throughout the training, Amigos emphasizes the importance of cultural sensitivity, and how to effectively communicate and develop relationships with fellow community members. Another reason why Amigos is unique is the rare opportunity of complete cultural (including linguistic) immersion. The concept of being completely immersed in the Spanish language, and a new culture, was both daunting and appealing. I knew it would force me to make new connections and relationships with my community members rather than hide in the shadows of other English-speaking participants. I ultimately chose Amigos de las Américas because of its goals, visions, and values. 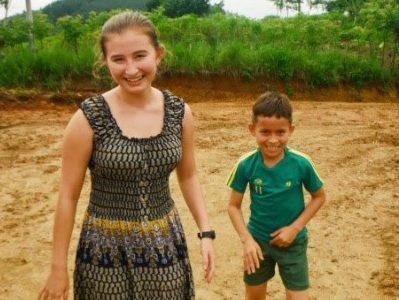 In 2014, I had the incredible opportunity of spending 7 weeks in rural Paraguay, in a small community called Caraguatay Gazu [care-a-guat-ay-ooh ga-zooh]. During our time in our community, my partner and I introduced ourselves to everyone and explained who we were and what we were doing there. We hosted a community meeting one rainy day and asked everyone what they envisioned as a community-based project that we could all work on and complete by the end of our visit. They decided on protecting the community’s water supply from animal contamination. In addition to collaborating on our community-based initiative project, we held daily camps with the school children every morning and afternoon with weekly themes such as environmental sustainability, working in teams, self-empowerment and more. In our free time, my partner and I made lifelong friendships and relationships with our community and family. We danced every night of the week, we played soccer, we learned how to cook, and we learned how to do specific chores such as harvest firewood or yucca from the fields. One of the best parts about the Amigos experience was breaking out of the Marin bubble and experiencing a new way of life. Paraguayans are without a doubt the happiest, most accepting people I have ever met. I always felt extremely safe in my community and always felt like I was surrounded by family. One day my partner and I were walking down the street and a woman we had never met before stopped us for a chat and invited us over for lunch, already referring to us as her daughters. The amount of compassion and respect in the relationships between everyone in my community was an incredible part of my Amigos experience. I would not be the person I am today without my Amigos experience. 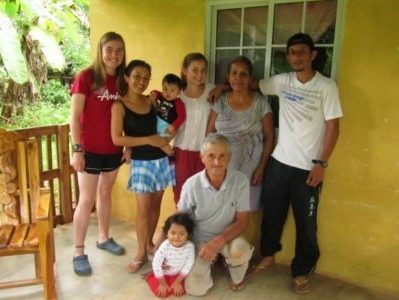 Living in Paraguay opened my eyes and heart to a new way of life with different values and priorities. I learned to appreciate family on a new level, and more so now than ever, my family is the most important thing in my life. I became much more grateful for my ability to receive an education, and live in an area where there is so much opportunity and I have the freedom to study, work, and live where I choose. My experience helped me to grow and develop as an individual to become more independent, confident, and organized. Learning skills such as integrating myself into a new community, public speaking, and taking on immense responsibility completely changed who I am. I am so appreciative of how Amigos helped me mature, and develop a better understanding of what I should prioritize in order to live a happy life. I now attend the University of Victoria, pursuing a B.Sc. double major in environmental studies and geography with a potential minor in education. Teaching kids in Paraguay about themes like environmental sustainability made me realize how much I love the subject and how much I love sharing my knowledge with other people, and learning from them in return. 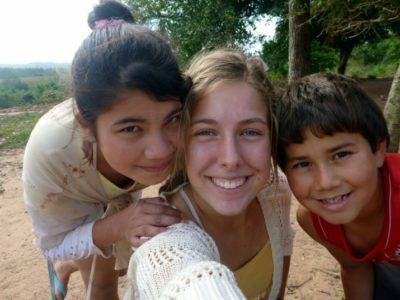 It has been over three years since living in Paraguay, and I still think about it every day. This program, and the opportunities it offers to students, are more valuable than I could ever express, and continue to influence the way I live my life today. In 2017, I went to Azuero, Panamá for 7 weeks. I lived with two other partners in a small rural community of about 100 people, which you can see in the video I made. The theme of the Azuero project was Environmental Sustainability and we had the phenomenal opportunity to work with the Panamanian Environment Ministry. The majority of our time in community we spent working and teaching at the primary school of 9 kids. I danced (a lot), learned to cook Panamanian dishes (they thought I was studying gastronomy), and made amazing connections with the kids, the parents, and the grandparents. Our community- based action project was the communal construction of a basketball court so the kids could safely play outside and have P.E and dance lessons on a flat surface. I got to be myself. There were no imposed or unreal expectations. The program benefits were based solely on how I interacted with people. My supervisor encouraged me to take initiative and I gained confidence in my decision making. The challenging parts are the things you really learn from; you take them as they are and work with them! 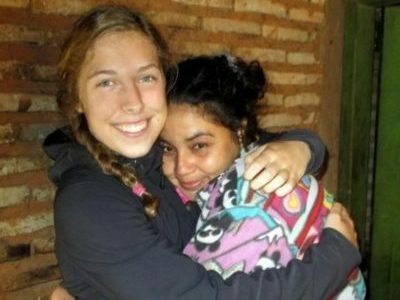 The program activities were a beautiful outlet for learning Spanish and making friendships. I met 3 teenage boys who had never had a friend that was a girl. I met a mother with 3 boys ages 6, 10, and 14. I got to be one of her daughters. I discovered the drastic differences and also the similarities between our two cultures. If you can’t tell… I had a wonderful experience. People are people wherever you go. No matter if you are in the most rural area or the most urban, around the wealthiest or poorest people, in the US or in Panama, people experience the same emotions and challenges. I learned kids are a strong and powerful force in enacting change for future generations and they hold so much potential. All you have to do is put in the effort to encourage them. I learned that “10 seconds is all it takes;” 10 seconds of courage can accomplish great things. I’m very thankful my family members were supportive and loving throughout my whole experience.For new Amigos, please enter with an open mind. Throw all your expectations out the window and attempt to embrace the experience fully. My story is mine and you will create your own; everyone has a different experience and gains different things but I can assure you will never regret choosing to commit to Amigos. They truly care for their participants and you are in good hands. Buena Suerte! The Marin Chapter covers AMIGOS program costs through a combination of product sales, donor contacts through an online campaign, and a family fee contribution. We chose these activities to maximize our ability to provide the AMIGOS experience to all participants without regard to family financial circumstances. All participants are required to fully take part in each fundraising activity as fundraising skills are an important component of AMIGOS training program and raise awareness of AMIGOS programs in the community. AMIGOS Marin participants raise funds through the sale of grapefruit, poinsettias, and chocolate. This effort primarily takes place in November and December, with follow-up phone calling in the spring. Participants receive considerable help with regard to sales strategies, and the experience gained in this effort will build important skills. Each participant will set up a fundraising web page and send letters via email to friends, family, and other contacts, requesting individual tax-deductible donations (the revenue from this effort is pooled). Ample support is provided at each step of the process. Participants pay their family fees beginning November 15, 2018. The fee must be paid by April 1, 2019. Fees can be paid online or by mail. AMIGOS actively recruits and supports inclusion of participants from diverse backgrounds. AMIGOS provides needs-based financial assistance with distribution determined by family income, number of dependents and special financial circumstances. We provide amounts of $250-$2,000 to qualified applicants as deductions to the family fee. Participants who are returning for an additional summer receive a $500 discount. With 50 years of experience preparing young people for travel and service abroad, AMIGOS training offers unparalleled global youth leadership development. Pre-departure training equips participants with the critical thinking, communication skills, and technical knowledge they need to make a meaningful impact across cultures while staying healthy and safe. The Marin Chapter AMIGOS training is youth-led, experiential learning that prepares participants for their AMIGOS experience, builds a community of youth and families with shared values, and develops life-skills to help participants succeed beyond AMIGOS. Relive the adventures of AMIGOS 2018 through this beautiful slideshow!